Today I finally finished the main apple pick, so tomorrow I will be going off to the orchard to get it juiced and bottled. 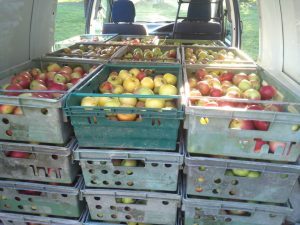 The picking season has gone on for months this year; because the fruit for the batch of juice that I am selling now was harvested in August, and here we are towards the end of October. Having said that, the weather today in the orchard felt more like August, it was only being surrounded by what remains of the foliage on the trees, in hues ranging from acid yellow through to chocolate brown, that gave the game away. 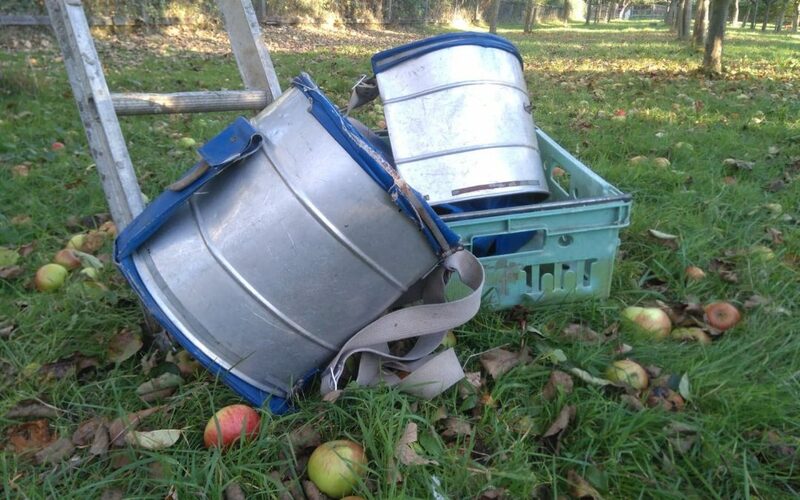 I’m not sorry that it’s over, the knees are barking a bit from ascending and descending ladders, and frankly I think I am suffering a little from apple fatigue, so I am looking forward to hanging up the apple picking buckets for another year. It’s not quite over yet though, because I still have the late dessert apples to pick, mostly D’Arcy Spice, but that will be a doddle after what has gone before. I mustn’t complain though, because the yield has been good, so there should be a more reliable supply of juice this year. I have kept back some cooking and eating apples for fresh sales, so pies, crumbles, strudels, sauces and cakes are all within your scope, and you can also munch on one with a nice piece of good cheddar, nom nom. I have been keeping an eye on a large wasps nest in the orchard all summer. 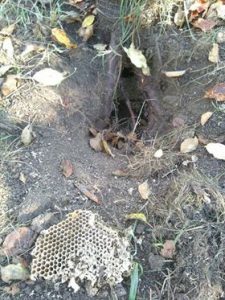 It was in a hole at the base of one of the apple trees, and was clearly a large colony, given the level of coming and going over the past few months. Well today I was passing the nest, and it was a site of utter devastation! The nest had been dug out, presumably by a badger looking for a high protein meal. 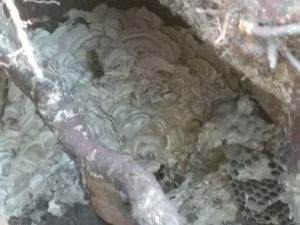 Some of the honeycomb structure had been dragged out on to the grass, and just a few wasps were coming and going, seemingly in a state of shock given the state of their home. As it happens the colony wouldn’t have lasted much longer anyway, as it’s only the queen that overwinters, so the badger raid just accelerated the demise of the worker population, but I still felt a pang of sadness at the turn of events. The other noteworthy nature event this week occurred last evening (Saturday) as I was leaving for home. As I drove past the stable blocks and joined the main drive, out in the parkland away to my left I saw the most magnificent stag running away from me. It was all alone, and had a massive set of antlers. I imagine that he was an unsuccessful combatant in the rut, but if he missed out I would love to see the sucker that defeated him, he must be a big ole boy! Have you heard? A blast of arctic weather is coming in by the end of the week. Yesterday it was comfortable in a thin jumper, today I was working in only a t-shirt, and next Saturday I will have seven layers on, gloves, hat, scarf, and 3 pairs of socks. Some soothsayers are predicting months of ice and snow for this winter, so I had better start stocking up on logs just in case. I am thinking of trying a snood this winter, I believe they are very effective, and quite fetching. The only tomatoes available this week are green ones; only a few red ones are left, and I will probably keep them for myself. Don’t look so indignant, they can be considered as well deserved grower’s perks. The only sweet peppers will be green ones, though some may be streaked with red. It’s high time that they were cleared from the greenhouse to make room for some overwintered greens, and I would like to get them established before the mother of all winters arrives. There will be perpetual spinach, broccoli, Swiss chard, Romanesco cauliflowers, lettuce, rocket, carrots, onions, red onions, leeks, mushrooms (hopefully Chestnut this week), parsnips, garlic, beetroot, turnips, baking potatoes and ‘Milva’ potatoes. There are cooking and eating apples, and kiwi fruit. 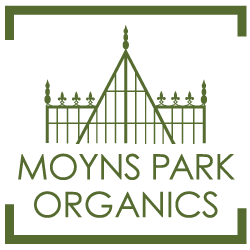 We will be at Steeple Bumpstead farmers’ market as well as at Wyken on Saturday; Jennifer will be snug and warm inside a village hall, I will be outside dressed like the Michelin man…..whoever said that life was fair? Anyway, come along and support your local market. Oh by the way, it seems that one of the new ‘hens’ is a cockerel. He/she/it crows rather splendidly, and is very attentive and courteous to its housemates, and one evening last week I was surprised to see it perched on top of Emily’s old swing in the garden, about 7 feet up! A debate is ongoing about what are we going to do about Beryl/Brian. Right, I’m off to rub some special ointment into my poor old broken knees, before hobbling up the wooden hills to Bedfordshire.